Welcome to Designs by Bear! My name is Bear, and I am the owner and designer of Designs by Bear. I started this company because I found it hard to create my own unique look from the clothing available at the mall or clothing stores. I love chiffon skirts, velvet jackets, blouses with dripping sleeves, all in gothic and romantic styles. 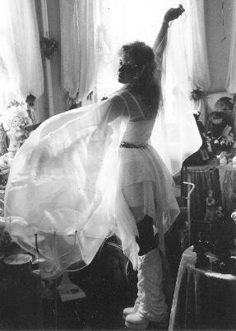 My biggest inspirations are Stevie Nicks and Betsey Johnson: the stagewear created for Stevie Nicks by Margi Kent was my first exposure to how clothing could cultivate a persona, and Betsey's clothes are an extension of her personality, proving that a designer could break out of what I considered to be the stuffy mold of high fashion. Always interested in fashion and sewing since I was a little girl, I enrolled in the Fashion Institute of Technology in New York City in the late 1980's. It was there that I learned more than just sewing: I learned about fabrics, how to make patterns, how to make my ideas real. I created my first mail order clothing catalog in the early 90's, and opened up a full internet store under the name Brandi's Dream in 1996. When I first opened up my shop online, I found no one else doing this kind of custom work, so I paved the way all on my own. My shop was, and still is, truly unique. All of my work is done in-house by me and I design every pattern and create every piece using professional grade machines. Though some of my greatest personal accomplishments have been designing wardrobe pieces for the film Gypsy 83, being filmed for VH1 FanClub, working with Walt Disney's Monsters Inc. On Ice and many eclectic performers all over the world, I consider every item I make to be an accomplishment, from a simple pair of leg warmers to a complete custom designed outfit. I hope I can help make your dreams come true.